Tesla now wants to build a factory in China with an annual production capacity of 500,000 vehicles, according to reports. The planned project comes just one day after Tesla hiked prices for the Model S and Model X in China due to a brewing trade war with the U.S.
Tesla is set to sign a memorandum of understanding for the project with local entities in Shanghai, according to Bloomberg, citing unnamed people familiar with the matter. The South China Morning Post reported that Tesla had already signed an agreement to set up the new factory in Lingang New City. A spokesperson for Tesla didn’t immediately respond to a request from Jalopnik. We’ll update the post if we hear back. CEO Elon Musk was in the city for an event on Tuesday, Bloomberg reported this week, amid the early stages of a fledgling trade war between Tesla’s home base in the U.S. and China. [...] Tesla said a year ago it was working with the Shanghai government to explore local manufacturing. Since then, production in China has become even more compelling: Last week, in response to tariffs imposed by the U.S., China increased the import duty on U.S.-made cars to 40 percent, compared with 25 percent last year, prompting Tesla to raise prices. A plant in China also reduces shipping costs and potentially makes sourcing components more economical. Musk has been clear that Tesla aims to make cars in China as part of an effort to rapidly grow in the coming years. In May, he said Tesla wants to launch production of the Model Y crossover by 2020, and he’d hinted that a plan to build a factory in Shanghai was imminent. If Musk’s word is accurate, Tesla only intends to build the Model Y and the Model 3 sedan in China. As Bloomberg very pointedly notes, ramping up production is crucial for Tesla to become financially viable. The automaker has struggled mightily to increase production of the Model 3, pushing back a goal of 5,000 cars per week twice and only hitting it this month. Sustained production at that level is key to Tesla’s ability to achieve profitability, a goal Musk also wants to hit in the third and forth quarter of 2018. Tesla won’t need to raise additional capital in the meantime, he adamantly maintains, leaving open-ended a question of where and how it plans to raise money for the plant in China. 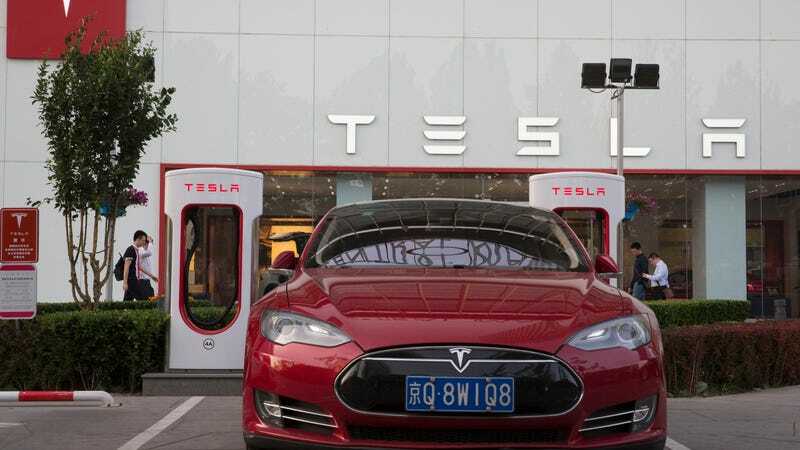 “We are delighted to have a strategic partnership with Tesla, and we welcome the development, manufacture and sale of pure electric vehicles in Shanghai,” the Shanghai government statement said. The Shanghai authorities released pictures of Mr. Musk and the mayor signing the deal. In a prepared statement, a Tesla spokesman said it will take about two years until the factory begins producing vehicles, and another two to three years before the facility is hitting its annual capacity of 500,000 vehicles. “Today’s announcement will not impact our U.S. manufacturing operations, which continue to grow,” the spokesman said. The 24 month turnaround also underscores the need for Tesla to raise additional capital to build from the ground up, and fast. That’s a lighting fast timeframe.